I love finding successful holiday marketing campaigns and this year I found the best one yet. Part of that is because I got to be involved on a small level. Not only is the video ad running on my blog, but I worked on some blogger outreach for the campaign. A spiritual message gets through…. It’s not common for a church to have one of the most viral marketing campaigns of the season (not sure if it’s ever happened). But this year a spiritual message did top the charts. The Church of Jesus Christ of Latter-day Saints (Mormons) is listed in the top 10 viral holiday campaigns of the year by AdAge. It came in at #9. This far surpasses last year’s campaign – “the month-long Christmas initiative, “He Is the Gift,” included a video that received about 34 million views.” Source. How did this campaign grow so large? Key to the campaign was influencer marketing. The church works with influential members that have large followings. Some are not members but other Christians. They engaged YouTube celebrities and bloggers all over the country posted their ad (the article doesn’t count paid views). Last year the church created the most amazing live nativity scene with The Mormon Tabernacle Choir (see it here). It also had influencers who helped by creating their own behind-the-scenes videos as well as directing people to the main video. Bloggers put ads on their sites with the video embedded (no autoplay audio). Church members were encouraged to share what the theme means to them. Everything centered on a high quality video that was on YouTube. There were animated gifs that you could share. 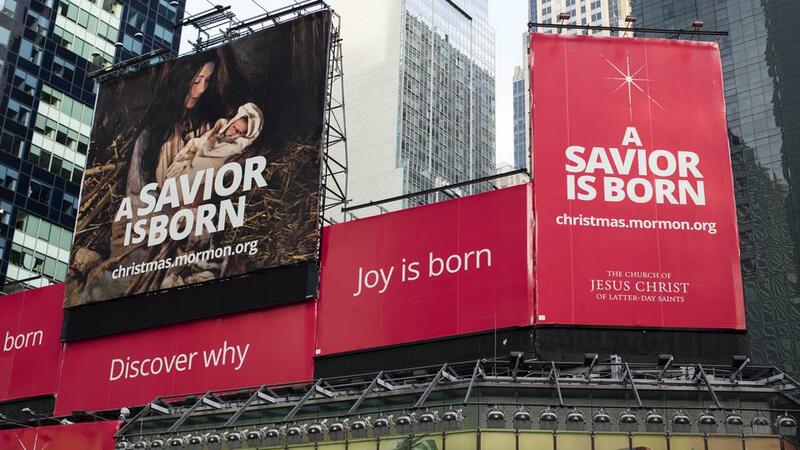 There was a sign that you could print on the website that said: “What does #ASaviorIsBorn mean to you? Print and share on social media.” This helped the message get out to other audiences. There were several billboards in Times Square announcing the campaign as well as on taxi toppers. Each day a different influencer released a video with music and added to the website, including my favorite by Lindsay Stirling. Other churches and businesses can learn by seeing how this amazing campaign was executed. What can you learn and apply? Regardless of your beliefs you have a message too and you want that message to be heard by millions of people. What could you learn from this holiday marketing campaign that could help yours? Even smaller campaigns can have an impact on people and communities. For example, I loved this local campaign from the Baptist church. They knit scarves and tied them on trees for people who are cold. Again, a moving way to celebrate Christmas with simple service. It’s a relief from the marketing messages we usually create and hear louder – buy, buy, buy. It’s important to me to remember Jesus Christ at Christmas – because of His birth and life we can be forgiven and return home to Him after this life. I celebrate this time of year with all of my Christian friends. Christ helps me in my personal life and in my business/career. I’m deeply grateful.